Capture epic aerial pictures and video with the Chroma Camera Drone family from Blade. With these innovative quadcopters, you are able to take breathtaking aerial shots from anywhere, including the mountains, the beach or even your own backyard. There are four versions of the Chroma Camera Drone, all of them perfect for first-time drone flyers. The Chroma Camera Drone with a CGO2+ 1080p camera is armed with a crystal-clear, high-definition camera designed to capture impressive photos from up above. It features an ST-10+ controller, which possesses a touch-screen display with intuitive Android interface that displays live video and real time telemetry info. 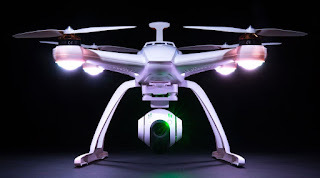 This version also comes with Follow Me Mode, which allows the drone to follow at an altitude and distance you set, as well as Tracking Mode, which enables the drone to follow and keep the camera pointed at whomever is holding the controller. The Chroma Camera Drone with a 4K CGO3 camera enjoys all the same features as the CGO2+ 1080p Camera Drone, but with one defining difference that makes this drone stand out. Its CGO3 4K camera allows for crisp, high-resolution photos and videos to be taken with never before seen clarity and detail. The upgraded camera on this drone is capable of capturing screen-quality images, and is one the highest quality cameras on the market that is compatible with a drone. Next, the Chroma Camera Drone with DX4 and 3-axis Gimbal for GoPro Hero allows pilots to easily attach their GoPro Hero cameras onto the 3-axis gimbal, so they can shoot epic photos and videos using their GoPro from an awesome aerial perspective. It comes with a Spektrum DX4 Controller, which makes it simple to put the drone in the perfect spot to get the best shots with its flight controls and gimbal control for adjusting camera tilt up and down. 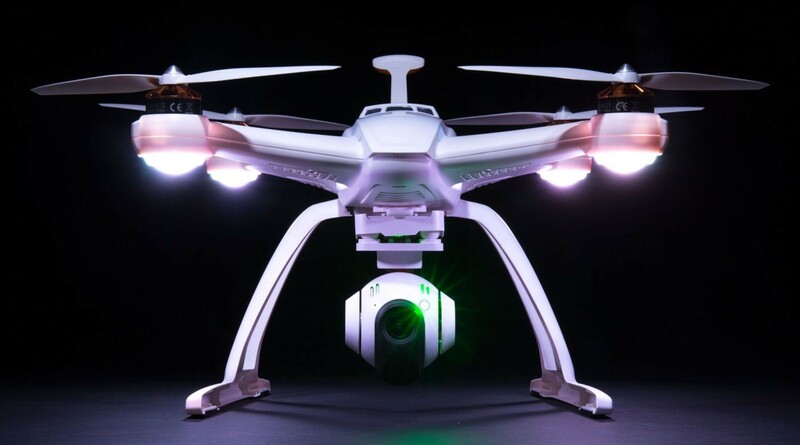 It also features a mast-mounted GPS antenna for superb signal reception, and a 3S 5400mAh Li-Po Flight Battery that allows for 30-minute flight times. Finally, the Bind-N-Fly version of the Chroma Camera Drone provides for another high-performance aerial platform for any GoPro camera. All you need to do is bind it to your Spektrum transmitter, attach your GoPro camera and you’re ready to go. It comes with a fixed camera mount that is durable and lightweight, and a 5400mAh Li-Po Flight Battery cartridge that allows for 30 minute flight times. Perfect for pilots of all skill levels, this model will allow you to capture incredible shots using any model of GoPro. The Chroma Camera Drones from Blade are unlike any camera drones on the market today. With unrivaled innovation, simplicity and performance, these quadcopters are a must have for any photographer trying to shoot amazing images from incredible perspectives. Browse RC Superstore today for all of the latest drones, parts and accessories!